The Pew Charitable Trusts has announced that University of California San Diego Biological Sciences Assistant Professors Matthew Daugherty and Enfu Hui have been selected to the 2018 class of Pew Scholars in the Biomedical Sciences. Pew also announced that Diego Alvarez and Grisel Cruz Becerra, Biological Sciences postdoctoral researchers, have been named new Pew Latin American Fellows in the Biomedical Sciences. 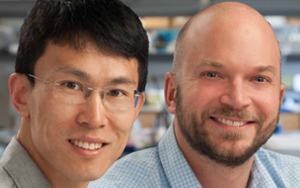 Daugherty and Hui are among 22 early-career scientists Pew named to investigate fundamental biomedical questions. They will receive four-year grants to advance their explorations of biological mechanisms underpinning human health and disease. The scholars—all of whom have held assistant professor positions for three years or fewer—enter a vibrant community of researchers who have received awards from Pew since 1985. Current scholars meet annually to discuss their research and exchange ideas with peers in fields outside of their own. This year’s scholars were selected from 184 nominations, each submitted by a leading academic or research institution in the United States. The 2018 awardees are working to solve biomedical puzzles including the development of cancers linked to viruses, how brain circuits enable verbal communication and the ways in which the body senses and responds to external stimuli. The results of their research could provide new scientific foundations for potential treatments of metastatic cancer, infectious diseases and psychiatric disorders. Five members of the 2018 class of scholars will receive awards with support from the Kathryn W. Davis Peace by Pieces Fund. They were selected for their commitment to investigating health challenges in the brain as it ages. As new Pew Latin American Fellows, Alvarez and Cruz Becerra are among 10 promising Latin American Scientists conducting innovative research who recently earned doctoral degrees from institutions in Argentina, Brazil, Chile and Mexico. Each fellow will receive two years of funding to study with a principal investigator in the United States. After the fellowship, Pew provides additional funding to awardees who return to Latin America to launch their own labs. About 70 percent of past fellows have taken advantage of this incentive and many now lead major academic and scientific research efforts in their home countries. The Pew Latin American fellows will embark on research projects under the mentorship of prominent biomedical investigators, including alumni of the Pew Scholars Program in the Biomedical Sciences. Research interests in the 2018 class range from understanding how neural circuits and brain connections develop to probing mechanisms of viral infection. “These young Pew fellows hold great promise not only as innovative scientists, but also as the next generation of leaders at research institutions throughout Latin America,” said Eva Nogales, professor in the Department of Biochemistry and Molecular Biology at UC Berkeley and incoming chair of the program’s national advisory committee. “The knowledge, experience, and professional networks these gifted scientists will gain through their fellowships will be invaluable as they contribute to the resurgent scientific communities in their home countries,” said Torsten Wiesel, the 1981 Nobel laureate in physiology or medicine who served as national advisory committee chair from the program’s inception in 1990 until this year. Matthew Daugherty received a doctorate in biochemistry and biophysics in 2009 from UC San Francisco. He continued postdoctoral training at the Fred Hutchinson Cancer Research Center until 2016, when he joined the faculty at UC San Diego as an assistant professor of biological sciences. The Daugherty lab will investigate how organisms can evolve resistance to infection and how pathogens can avoid or subvert those defenses. Disease-causing agents and their hosts are locked in a constant struggle for evolutionary dominance. As viruses and bacteria devise new ways to penetrate host defenses, host cells counter with methods to avoid or eliminate infections. The resulting molecular “arms races” drive innovation on both sides of the conflict, leaving characteristic evolutionary signatures in the genomes of hosts and pathogens. Using an integrated approach that combines biochemistry, genomics, evolutionary biology and virology, Daugherty and his colleagues will leverage this combative relationship to discover new mechanisms of host immunity and pathogen evasion. They are particularly interested in the evolution of systems that modify or degrade proteins, as initial studies identified these as rapidly evolving hot spots of conflict between pathogenic viruses and the human immune system. These genetic differences, driven by the constant need to keep pace in escalating host-pathogen conflicts, can establish barriers that prevent pathogens from jumping from one host to another. Therefore, this work will shed light on how pathogens evolve to move between species and among different individuals in the human population and could lead to innovative approaches for preventing or treating infectious diseases. Enfu Hui received a doctorate in biophysics in 2009 from the University of Wisconsin, Madison and conducted postdoctoral training at UC San Francisco. In 2016, Hui accepted a position as an assistant professor of Cell and Developmental Biology at UC San Diego. The Hui lab will dissect the mechanism by which the immune system can be exploited to eradicate cancers. Some tumor cells evade immune detection by binding to PD-1—a receptor that keeps immune cells switched off; drugs that block PD-1 have recently shown promise in treating these cancers. As a postdoctoral fellow, Hui discovered that PD-1 suppresses immune cell activity by blocking the activation of a stimulatory receptor called CD28. Now, the Hui Lab will determine whether and how additional immune “checkpoints” operate in conjunction with PD-1 to block CD28 or other immune receptors, and they will identify the inhibitory molecules these systems recruit to dampen the immune response. The Hui Lab’s findings could lead to the development of novel immunotherapeutic agents and could hold the key to treating patients who develop a resistance to inhibitors of PD-1. Diego Alvarez received a doctorate in biological sciences in 2017 from the University of Buenos Aires. He is continuing his postdoctoral training in the UC San Diego laboratory of Brenda Bloodgood, a Pew scholar. In the Bloodgood lab, Alvarez intends to investigate the molecular and genetic mechanisms that direct the development of the brain’s visual circuitry after birth. For neuronal circuits in the brain to develop properly, animals must process optical information coming from both eyes. Sensory deprivation in either eye during this so-called “critical period” of development can result in a permanent loss of visual acuity or focus. In baby mice that are reared in the dark, exposure to light triggers the production of a protein called Npas4, suggesting that it may play a role in neuronal rewiring in response to light. Using techniques in molecular genetics, physiology and neural imaging, Alvarez will assess whether eliminating the activity of Npas4 in mice disturbs the formation of functioning visual circuits—and whether boosting Npas4 activity can extend the period of time during which this essential development occurs. If loss of Npas4 does indeed disrupt visual circuit development, Alvarez will then explore whether exposure to an enriched visual environment (e.g. a larger cage with more toys) can overcome deficiencies caused by disabling Npas4. These findings could lead to novel treatments for conditions that impair visual focus early in life, such as amblyopia or lazy eye. Grisel Cruz Becerra received a doctorate in biochemistry in 2017 from the National Autonomous University of Mexico. She plans to continue her postdoctoral training with James Kadonaga at UC San Diego. In the Kadonaga lab, Cruz Becerra will explore the role that structures called “prenucleosomes” play in regulating gene activity. To produce a compact chromosome, long strands of DNA are wound tightly around spools of proteins. These protein-DNA bundles form the nucleosome, a particle that controls access to the underlying genes. The regulatory regions of active genes tend to lack nucleosomes—and instead appear to harbor prenucleosome-like structures that include shorter lengths of DNA that are less tightly coiled. By using an array of cutting-edge tools in biochemistry, molecular genetics and genomics, Cruz Becerra will investigate the formation and function of prenucleosomes in cells. She will identify proteins that selectively interact with prenucleosomes and assess whether they can convert nucleosomes into prenucleosomes—an action that could help activate genes. She will also map the prenucleosomes in embryonic stem cells and determine whether their location corresponds with genes that are switched on as the cells specialize. Findings from this work should lead to new insights into how gene activity is controlled and could provide new approaches for gene therapies and treatment of human diseases.